homework assignments, or just casual passing conversation, the kitchen is the central hub of the modern home. One way to significantly increase both your quality of life and the value of your home is upgrading or replacing your kitchen. By taking advantage of the services offered by our cabinet refinishing contractors in Las Vegas, NV such as ERX, you’ll have the opportunity to transform your kitchen into your favorite room of the house. Best of all, improving your kitchen doesn’t have to cost you an arm and a leg either. In fact, it’s rarely necessary to completely replace everything when, in many cases, a few simple changes and upgrades are all you need. Here are some tips on how to upgrade your kitchen to ensure that it remains or can become the central hub of your home. Not only is a gloomy kitchen an unsafe place to work in; it can also be downright miserable. Every kitchen design should prioritize lighting both for the sake of comfort and safety. Opening up your kitchen to as much natural light as possible is especially important, hence the increasing popularity of open-plan designs that tend to make better use of space and let more natural light into the area. Artificial lighting solutions for kitchens come in many different forms, ranging from dimmer-compatible overhead lights to elegant steel lighting systems subtly installed beneath the upper cabinets. Whatever form of artificial lighting you choose, make sure you have plenty of it so when the sun goes down, your kitchen can be completely lit up. One of the home improvement services we offer is kitchen cabinet refacing and refinishing, which presents a much more affordable option than completely replacing your kitchen cabinets but can still completely change the look and general feel of your kitchen. Over time, the cabinet doors in your kitchen can become worn down and grubby-looking, but that doesn’t mean that there’s anything wrong with the underlying structure. The goal of refinishing your kitchen cabinets is to have them looking like new without installing full, brand-new units. By simply refitting them with new door hardware, or by stripping and re-staining them, the look of the whole kitchen can be dramatically improved. Additional improvements such as new upgrading the hinges and handles can also help give an older kitchen a new lease of life. Whatever it is, cabinet refinishing is the way to go when you want to redo the look of your kitchen on a budget. 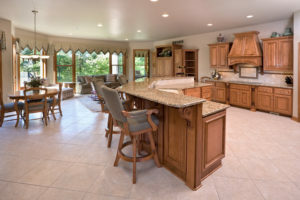 Should you decide to update your kitchen by refinishing your cabinets, be sure to call us at ERX. We will ensure we leave you with top-of-the-line, gorgeous cabinets with no stress for you. A clean and tidy kitchen is a safer and more comfortable one, but it’s not always easy to keep the room looking its best if it’s not optimally organized. As such, plenty of storage is essential for avoiding cluttered countertops. It might not always be easy to keep a particularly small kitchen tidy, but even a few minor changes can make a world of difference. Installing pull-out shelves, drawer organizers, small wire shelves, and a decent dish rack, for example, are some cheap and easy upgrades that can really make an impact. Small things really go a long way. With these simple tips and tricks, you can get your kitchen looking brand new.